Ferrari has extended the testing and development program of its forthcoming GT supercar based on the FXX prototype for a further two years “following an extensive upgrade to boost performance and handling,” says a factory source. Being a little down on power (I jest), the FXX has had the output of its 6.2 liter V12 increased from 800 hp (600 kW) to 860 hp (640 kW) at 9500 rpm and gearshift times are down 20 milliseconds to 60 ms. Gear ratios have also been modified to make use of the extra 1000 rpm available. Yes, I’ve always thought that an 80 millisecond shift is dreadfully slow! Handling-wise, nine settings will be available on the new traction control system, which Ferrari claims is also “less invasive and more flexible, adapting more efficiently to the individual driving style of each driver”. Sounds good, especially if your surname is Schumacher and your first name is Michael. Chassis modifications have seen improved wear rates for the 19 inch Bridgestone tyres, while the Brembo brakes (which include composite ceramic material discs) have longer lasting brake pads. When you are paying 100 million baht for your car, do you really care about tyre wear? Furthermore, a number of new aerodynamic aids have been produced to increase downforce over the rear axle, including a new rear diffuser and rear flaps. Combined, the aerodynamic efficiency has increased 25 percent. “The active front spoiler control system settings have been adjusted to take these modifications into account, too,” Ferrari said in a statement released this week. Underway since late in 2005, the FXX program involves a small group of customers who have each spent more than 100 million baht for the privilege of owning a track-bound test mule and being involved in the Enzo-based car’s development. So there you are, if you want to be part of this exclusive group of Ferrari test drivers and rub elbows with a certain Mr. M Schumacher in the Ferrari pits, put your money down now. They’ll even come on over and collect it, I am sure. Last week I wrote that one central headlight was seen on many cars over the years, the revolutionary Tucker Torpedo being a classic example. However, there were many before that. I asked what was the first American car with ‘cyclops’ headlights? The correct answer was the Garford of 1913, or I would have even taken the Briscoe of 1915. So to this week. Let’s stick with headlamps. When did headlamp flashers first become offered, and on what car? Toyota Australia has confirmed that it is investigating changing the sourcing of its next Yaris, with Thailand considered as the leading contender for the new third generation model due in about 2010. Toyota Australia chairman emeritus John Conomos said at the 2007 Tokyo Motor Show that Thailand is shaping up as the ideal Yaris production location. “It’s been looked at. Thailand is a great source for reliable world-class product,” said Conomos. “With a Free Trade Agreement (FTA), it is inevitable that we will have to examine (Thailand) carefully,” Conomos admitted. Currently the Yaris - Australia’s top-selling light car by a large margin, and in a segment that is the fastest growing this year - is built in Japan. With the Thai government lately focussing on winning more light and small car production contracts - after its successful campaign in luring management understands that the pricing edge that comes with choosing a lower-cost production base can be extremely lucrative. Since arch-rival Honda changed its Jazz light-car sourcing from Japan to Thailand in early 2006, sales have rocketed on the back of the lower entry price and higher standard features content the move brought with it. This year Jazz is running at around 980 per month, against 786 last year and 660 in 2005. And this is in spite of the fact that the Jazz - released in 2002 - is now narrowly the second-oldest in its class (though there will be a new Jazz in the early part of 2008). Ford Australia has already announced that its next Fiesta light car will follow the Honda by coming out of Thailand, as part of a 50:50 deal it has with its Japanese partner Mazda. Mazda will also produce the closely related ‘2’ light car at the same Thai facility, and it is most likely that the Mazda 2 will be sourced from the Rayong plant for the Australian market. This is all good news for the local economy. 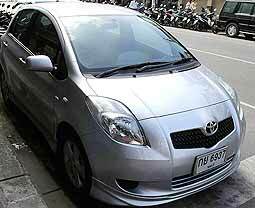 However, the Toyota Australia veteran executive did point out that Thailand’s inability in the past to provide vehicles with adequate levels of equipment and/or technological sophistication may yet rule it out from providing Toyota Australia with the next Yaris. Both the LA Show and the Tokyo Show were notable for personal concept vehicles. These are vehicles (I can hardly call them “cars”) which take one person and are more like mobility devices than any other type of transport in common use. 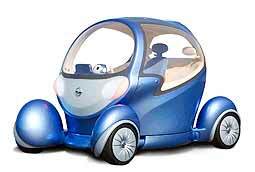 At the Tokyo Show, Nissan presented the Pivo 2, an advanced electric concept car. Powered by advanced compact Lithium-ion batteries, Pivo 2 employs ‘by-wire’ technologies for braking and steering and features a 360 degree turning cabin and 90 degree turning wheels that makes reversing a thing of the past. In addition to advancements on this radical rotational design, this second generation Pivo uses a Robotic Agent to create a unique owner-vehicle relationship that is akin to that of a friend. Where the first Pivo, with its fully rotating cabin design, made reversing obsolete, the Pivo 2 takes that easy mobility concept to a new level. Each of the four wheels are powered by Nissan’s advanced electric In-wheel 3D Motor and can turn through 90 degrees to allow Pivo 2 to drive sideways as well as forward - making parallel parking in even the tightest places as simple as driving straight ahead. Thanks to the highly innovative Robotic Agent, you are never alone in the Pivo 2. With conversations possible in Japanese and English, the Robotic Agent has been created to work with Pivo 2 to make every journey less stressful. It provides a unique interface through which to communicate with Pivo 2 on everything from basic vehicle functions through to the nearest available parking. Whilst I cannot see something like this taking off as a family chariot, I can see these devices being used as personal commuters. They do not take up much space on the roads, are pollution free, and being rechargeable, should be cheap to run. The Robotic Agent looks a little like overkill to me, but for gimmick value probably hard to beat. Narain Karthikeyan - will the Force be with him? With the announcement that Spyker F1 has been bought by an Indian magnate and renamed Force India, who will drive for them? Put your money on Indian Narain Karthikeyan, currently the third driver with Williams F1. Karthikeyan’s interest in motor sport began early, as his father was a former Indian national rally champion. With his ambition of becoming India’s first Formula One driver, Karthikeyan finished on the podium in his first ever race, at Sriperumpudur. He then went onto the Elf Winfield Racing School in France, becoming a semi-finalist in the Pilote Elf Competition for Formula Renault cars in 1992. He returned to India to race in Formula Maruti for the 1993 season, and in the same year, he also competed in the Formula Vauxhall Junior championship in Great Britain. In 1994, he returned to the UK, racing in the Formula Ford Zetec series as the number two works Vector driver for the Foundation Racing team. Karthikeyan also took part in the British Formula Ford Winter Series, and became the first Indian to win any championship in Europe. 1995 saw him in the Formula Asia Championship for just four races. In 1996, he had a full season in the series and became the first Indian and the first Asian to win the series. He moved back to Britain in 1997 to compete in the British Formula Opel Championship, taking a win at Donington Park and finishing sixth in the overall points standings. In 1998, Karthikeyan made his debut in the British Formula 3 Championship. Competing in only 10 rounds, he managed two 3rd place finishes in the final two races of the season. He continued in the championship for 1999, finishing on the podium five times, including two wins at Brands Hatch. Continuing his drive in the British F3 Championship in 2000, he finished 4th overall in the standings, and also took pole position and fastest laps in the Macau Grand Prix. He started 2001 in the Formula Nippon F3000 Championship, finishing the year amongst the top ten. Karthikeyan again tested for Jordan, finishing just half a second off the pace off Jordan’s lead driver Jean Alesi. In 2002, he moved into the Telefonica World Series with Team Tata RC Motorsport, taking a pole position and setting the fastest lap time at the Interlagos Circuit in Brazil. Moving to the World Series by Nissan in 2003, Karthikeyan won two races and came 4th overall in the championship. On February 1, 2005, Karthikeyan announced that he had signed the preliminary deal with Jordan Formula One team which made him India’s first Formula One racing driver. So now to Force India in 1998? Put your money on it.